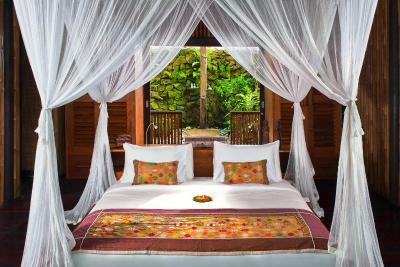 Lock in a great price for Fivelements Bali Retreat – rated 8.5 by recent guests! The place is beautiful, calm and peaceful. I love the sound of the river, and birds. They not only hosted our wedding blessing ceremony, but they all photographed the entire thing at no additional cost. Best massages we have ever had and the most delicious food!!! Everyone was super friendly and we can’t wait to come back! Beautiful setting with unique design, first class services and amazing Spa. 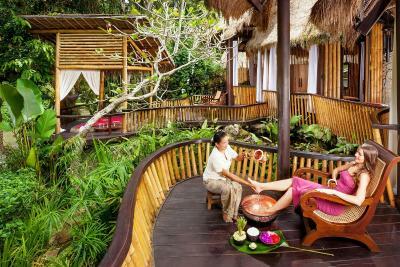 Cannot stress enough that it is a must to try spa treatments while you stay here. Everything was excellent. John was very warm and welcoming and all the staff was very kind and polite. Location was very relaxing and detoxing. Best Food ever had. 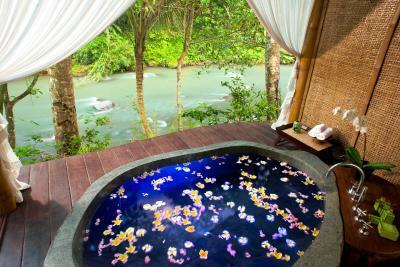 Rooms are very spacious and relaxing on bathtub facing the river was a dream. Awsome veg food.Thank you to everyone. Unique experience with the wooden villa and the bathtub by the river. We quite enjoyed taking bath by the river. The bathtub can accommodate two people at a time, which is great. The staff is warm and helpful. The restaurant serves all vegan food. 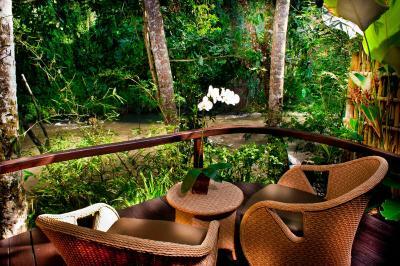 The location is a little hard to find, but that is what makes it quiet and good for getaway from daily urban life. Wonderful place with an extraordinary energy! Loved it! Food was awesome and not too expensive for the quality. Breakfast delivered to room. Bath facing the river was very relaxing. Good vibe. The friendliness and always willingness to assist of the very kind staff. Beautifully presented vegan food. 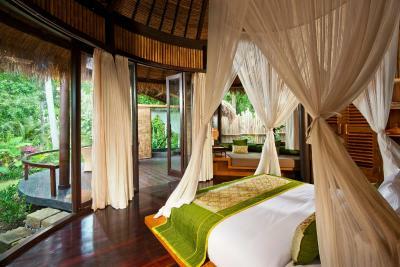 The rooms were exquisite, set in nature. 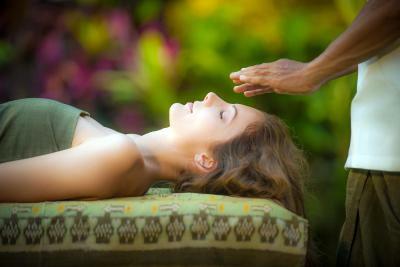 The massages and treatments were unique and beautiful. 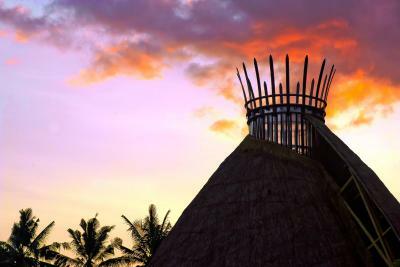 There is a free shuttle to Ubud which operates three times a day. 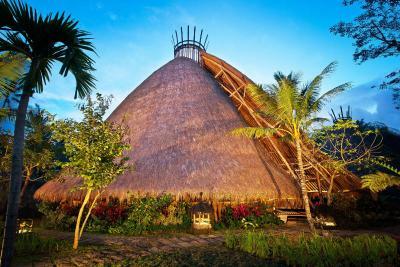 Fivelements Bali Retreat This rating is a reflection of how the property compares to the industry standard when it comes to price, facilities and services available. It's based on a self-evaluation by the property. Use this rating to help choose your stay! 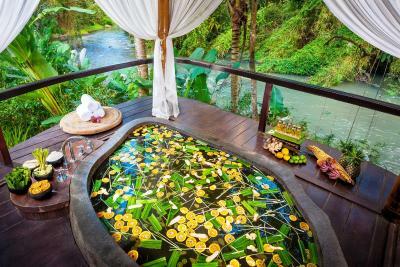 One of our top picks in Ubud.Fivelements Bali Retreat offers an award-winning eco luxury wellness retreat with free Wi-Fi located along Ayung River, surrounded by tropical greenery. 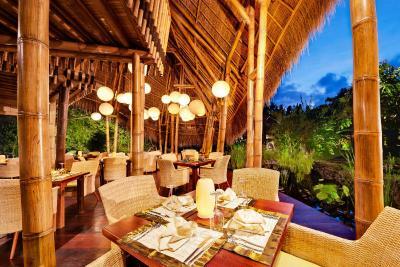 Boasting a restaurant, it features an outdoor pool, spa and free scheduled shuttle service to central area of Ubud. Smoking and alcohol are not allowed within the premises. 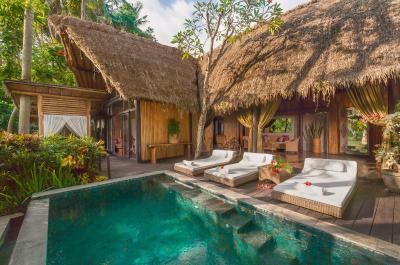 Spacious open-concept villas offer sweeping views of greenery and are fitted with iPod docks. They feature private balconies with outdoor seating and fine wood furnishings. Private bathrooms have a customized bathtub that will help with improving wellness. 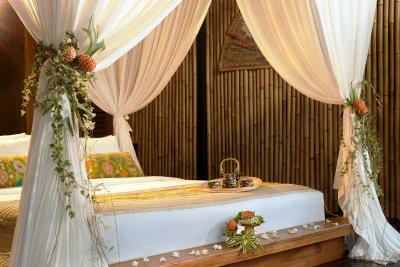 Traditional Balinese treatments and massages await guests at Puri Ahimsa’s healing center. Guests can enjoy a quiet moment in the gardens or lounge by the outdoor pool. Laundry service is available. 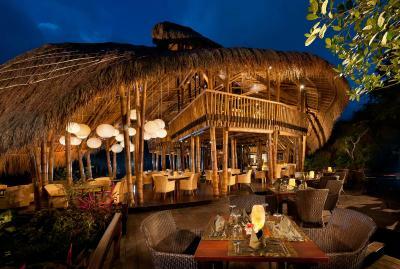 Fivelements Bali Retreat has a Vegetarian restaurant that offers a range of Indonesian and Western dishes. Meals can be served in rooms during restaurant operation hours. 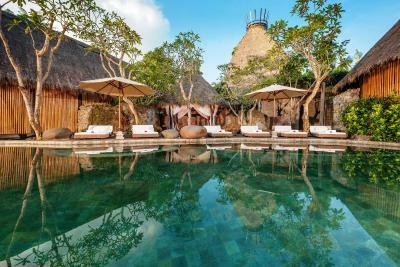 Fivelements Bali Retreat is a 20-minute drive from Ubud Palace and an hour’s drive from Ngurah Rai International Airport. 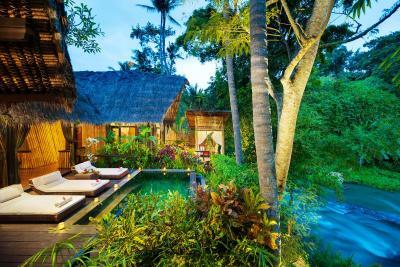 When would you like to stay at Fivelements Bali Retreat? 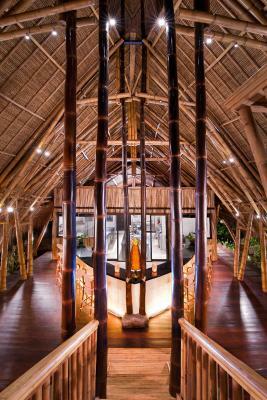 House Rules Fivelements Bali Retreat takes special requests – add in the next step! 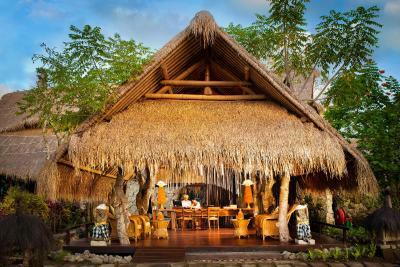 Fivelements Bali Retreat accepts these cards and reserves the right to temporarily hold an amount prior to arrival. Please note that alcohol and smoking are not allowed on the premises. 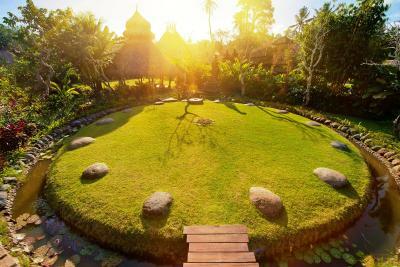 Location - it is too remote from Ubud and I had not seen that it is not in Ubud but 25 min drive from Ubud, totally vegan and you cannot drink a glass of wine even or have regular Yoga sessions offered in the morning in the gorgeous hut they have for this. The concept is not right. The stream of the outdoor shower is too small. Sometimes there were mosquitos around when taking shower. Limited free shuttle to Ubud City Ctr. Room was cosy but too dim in the night. Spa packages expensive. Need to pay for yoga classes. Outdoor shower but staff were seen working on the roof of the cottage next door (they were there for a couple of hours), prior notice would be appreciated. Reviews here mentioned they were greeted by a flower bath but we didnt get the experience. The lighting in the outdoor bathroom was good for ambience setting but proved a little challenging for makeup application. 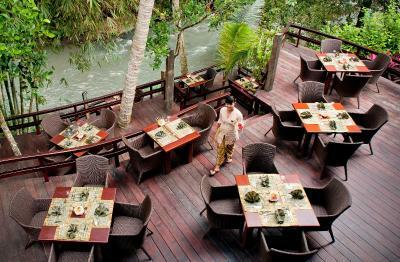 Very nice hotel in a secluded location right at the river. great outdoor private bath on the riverside, nice pool too. 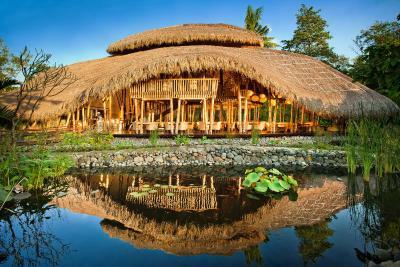 The hotel is far from Ubud, but if you are loking for a quiet retreat, this should be fine. 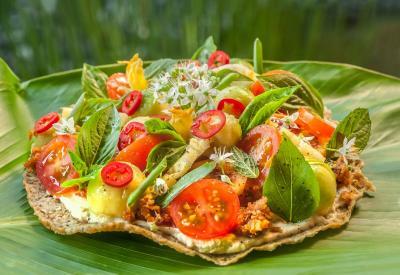 Good vegan and gluten free food, well presented, expensive for Bali. The hotel is not cheap, but it worth every coin you pay for it. Everything is just great. Just get there and have a chance to fill the beauty of the nature. The room with large bath is espectacular. 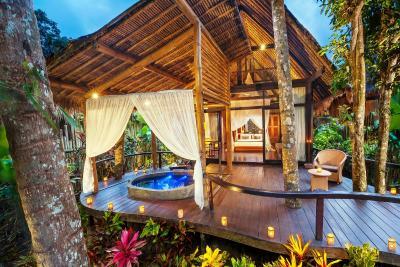 The massage you get there is probably the most expensive you find in Bali, but also is definitely will be one of the best massages you will have in your life. Restaurant was also great. Needs to be awaire of mosquitos. Hotel gives you a spray. Don’t forget to use, other wise in a minute they find you. In the middle o the bautiful nature. Near the river. Perfect meals with perfect plate decoration, vegan foods. Wonderful staffs. 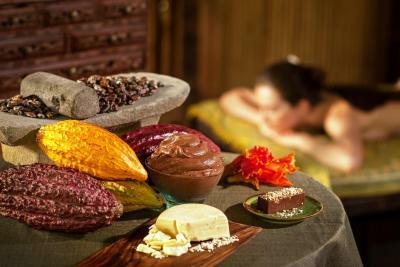 Wonderfull massage alternatives. The only negative thing I can say about the property is their FB selections. It’s only Raw vegetarian meal so the selections are limited. 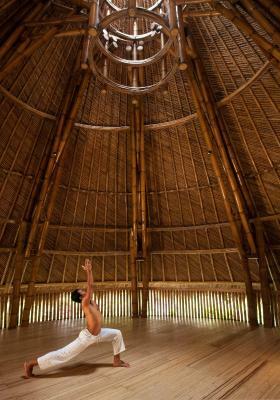 It would also be great if they offer schedule activities such as Yoga classes, as one is expected for a “retreat “ property. I did not like the mis leading of location. You state that the resort is in Ubud however it is actually in a district called Mambal which is not a region of Ubud so this was very misleading and caused a big inconvenience for us to get to city center as we chose this place as we thought it was close by to Ubud center. So be aware of this. Five elements however did apologies for this inconvenience and compensated us well which was very honorable of them. So I did appreciate that. However we later realised that the location of the resort is in such a place as it allows local people within the area to have jobs - as without us coming to stay there, there would be no jobs for them. So this made us feel a lot better about our decision to stay here as it gives a chance for local jobs within the area. And the resort does have a shuttle that you can pay for that takes you back and forth to the center of Ubud and is approx 25 mins. Five elements is a beautiful place. 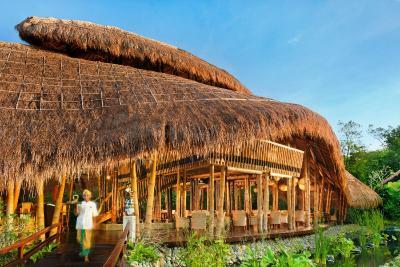 Stunning eco friendly resort. Has a very peaceful and loving atmosphere. 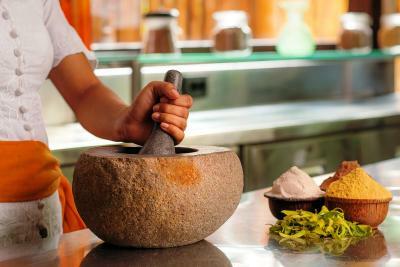 Feel instantly at home by the loving and caring staff who will cater to all your needs. I mentioned that it was mine and my partners anniversary and they made special arrangements in our room when we arrived to spread rose petals all over the room which was a lovely thought. The room was amazing, the view outside our room with the bathtub across the River was stunning. The Rooms were very clean throughout our stay. Food was amazing! All Vegetarian Food which was delicious and prepared to a high standard. 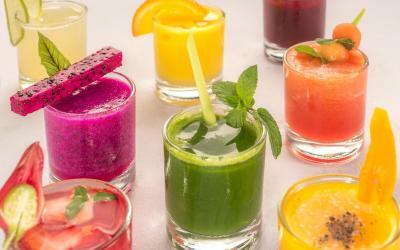 Breakfast was amazing every morning which had amazing fresh juices and fresh ingredients. We loved the members of staff who were highly attentive to our needs and would go out of their way to prepare whatever we wanted. The spa and health treatments is really why would stay here as they have amazing treatments that are prepared by highly skilled locals. We had a beautiful Reflexology treatment by a lovely man called Agong who is an intuitive healer and helped heal our body through the art of Reflexology. 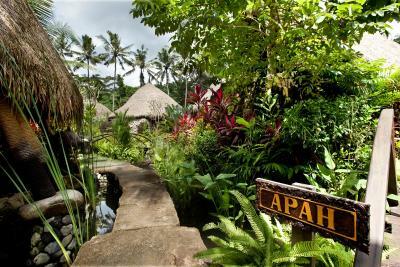 If you are looking for a more attentive experience than your average massage parlor in Ubud then you have come to the right place! I would highly recommend that deep cleanse avocado facial which was carried out by a lovely lady called Elle who made my face so glowing and radiant. We wanted to also thank Jasmine who is another therapist who undertook our colon cleanse treatment with such dedication and professionalism - she really does know her stuff and has a very calming and peaceful energy to help you ease in to the treatment. I highly recommend her and also the treatment. Totally gave our body a reset and beautiful cleanse. 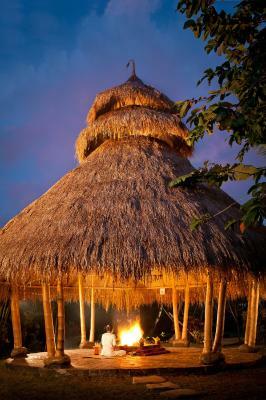 We also had a Fire ceremony which was very beautiful and a intimate experience for both me and my partner. 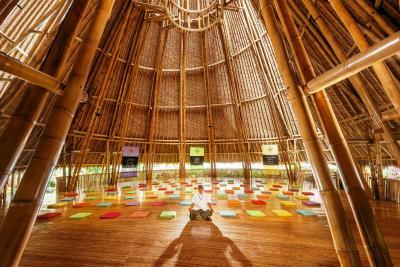 Overall this place is a beautiful and peaceful retreat which is perfect for relaxation and resetting your body. The atmosphere in the resort is great. 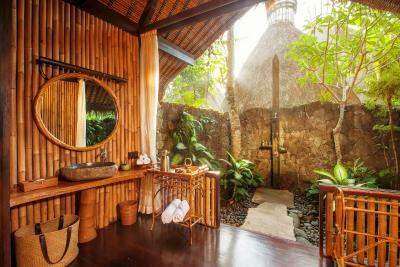 Rooms are very special, outdoor bathroom is supercool. Food is great even if its vegetarian and raw. Very helpful staff.